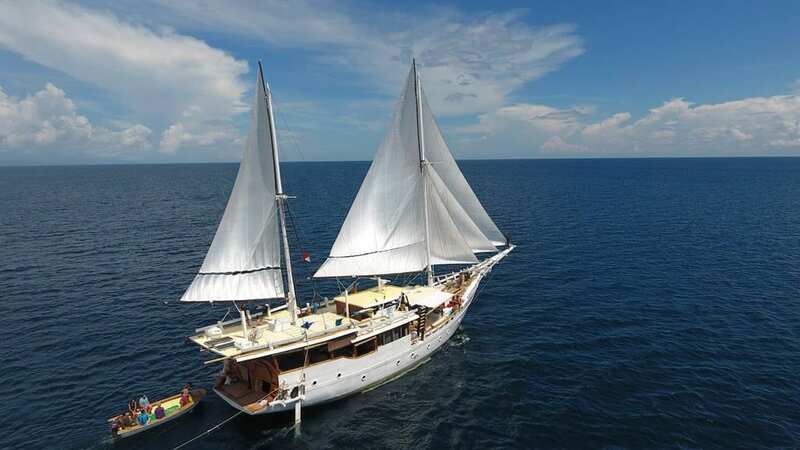 Teman Liveaboard is a beautiful traditional two-masted Phinisi sailing boat, finished to perfection in warm tropical teak. 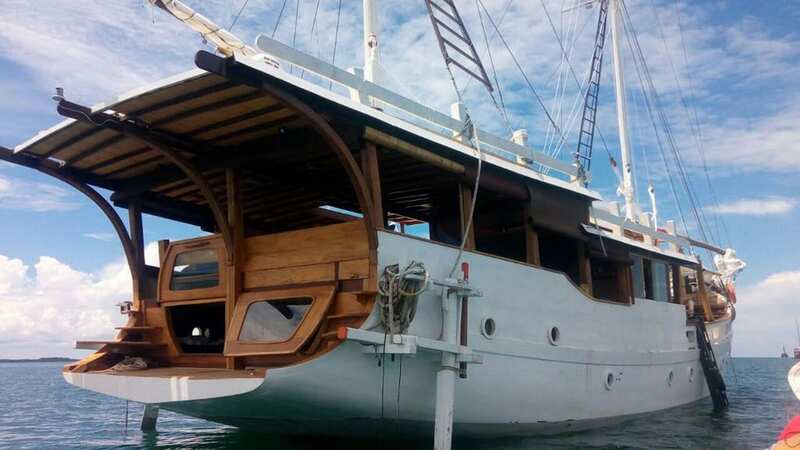 A recent addition to the class of luxury liveaboards which sail the waters of Eastern Indonesia, the Teman Liveaboard has been designed to provide the perfect balance between practical liveaboard diving and cruising luxury. 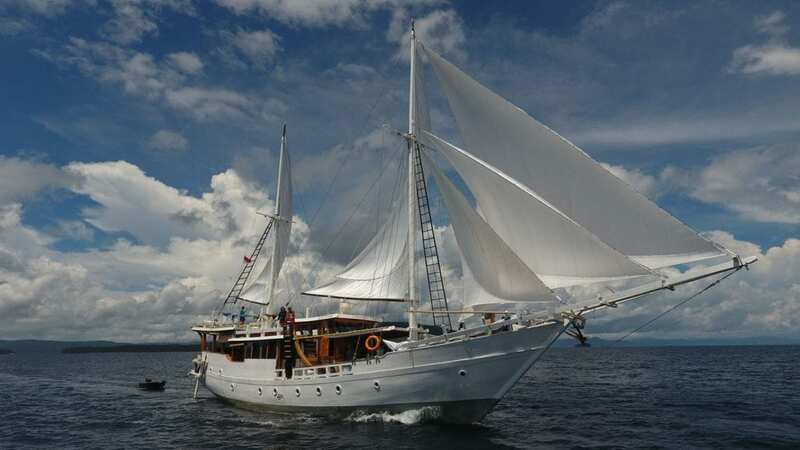 Though she is 36m in length the Teman Liveaboard accommodates just 12 divers in 5 well-appointed cabins. 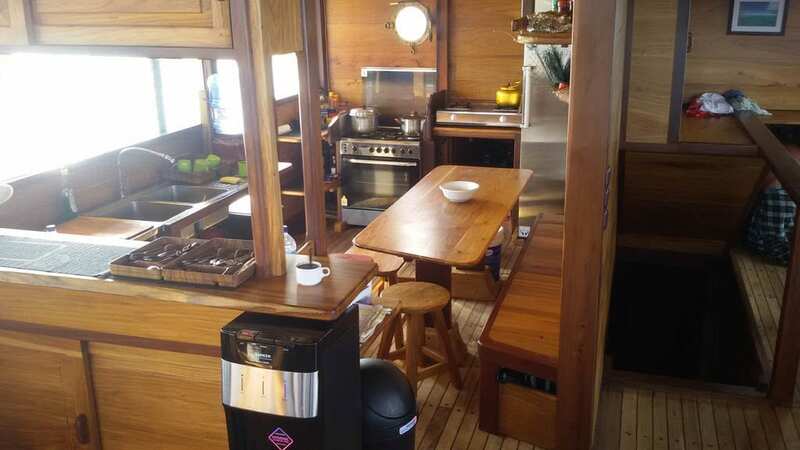 Teman Liveaboard has been designed to offer as much space as possible for guests to relax and enjoy the incredible landscapes during their journey. 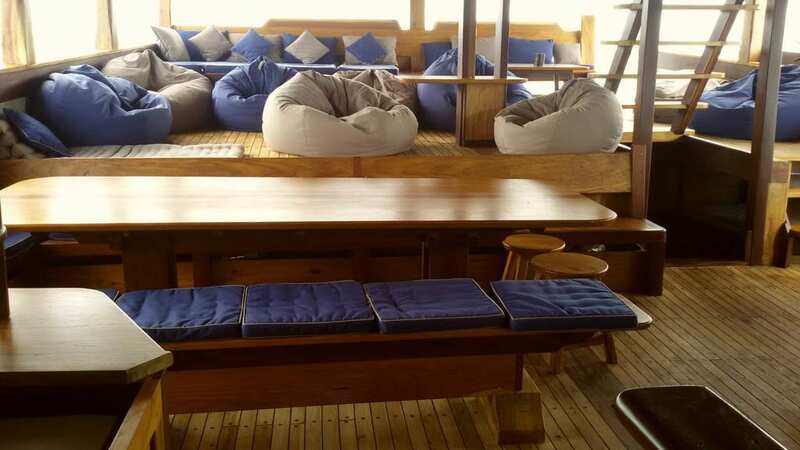 Whether that’s on one of the sun decks or protected from the sun out on the open deck everyone can find the perfect spot to rest and enjoy the spectacular views. The lounge has plenty of space to relax, and the adjacent dining area has a magnificent wooden table to seat all guests. It opens straight on to the open kitchen from which delicious eastern and western dishes ensue. Three meals per day, as well as fresh bread and homemade cakes and pastries, other snacks, coffee, tea, milk and drinkable water are all inclusive in the price. Soda and alcoholic beverages are available at an extra charge. 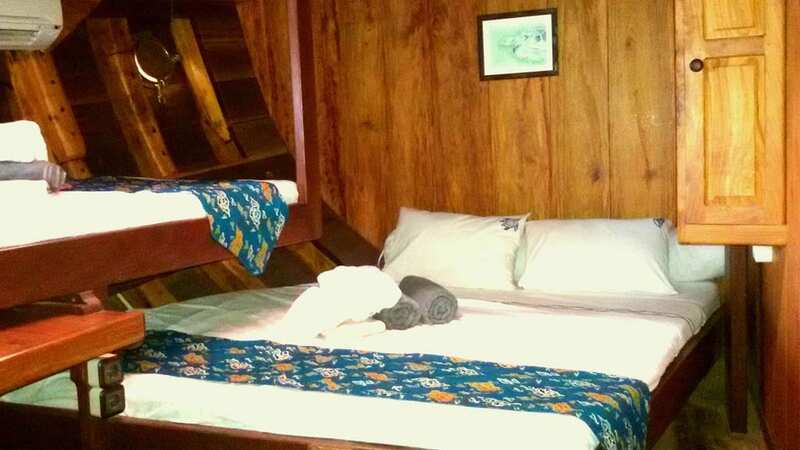 Each of the cabins is designed for an occupancy of 2, or 4 persons. 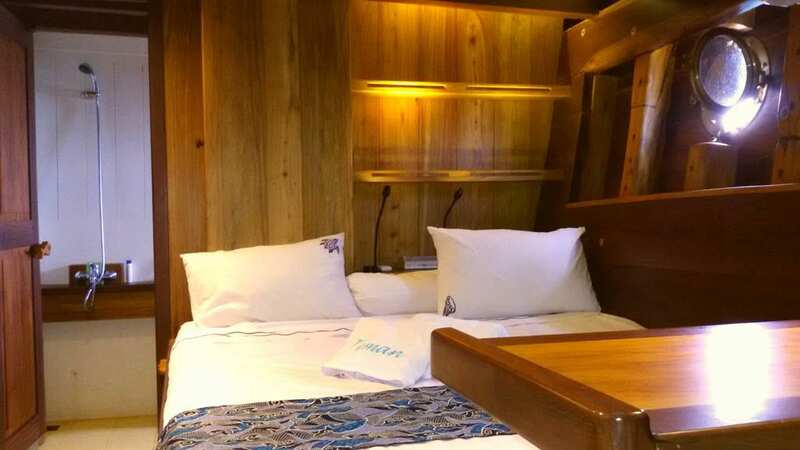 Four of the cabins are located in the front of the boat, and one on the stern. SERAM and CELEBES have a double bed and a single bed. BANDA and MALUKU have a double bed and a bunk bed. 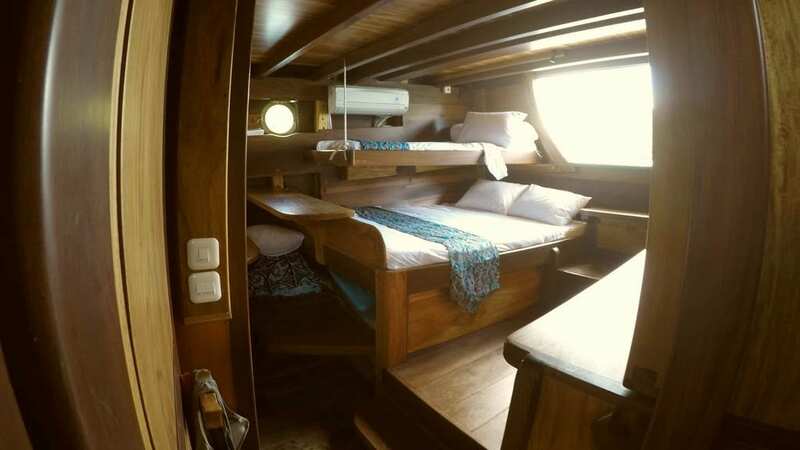 FLORES, on the back of the boat, has a double bed and a bunk bed with a direct access to the stern skirt. 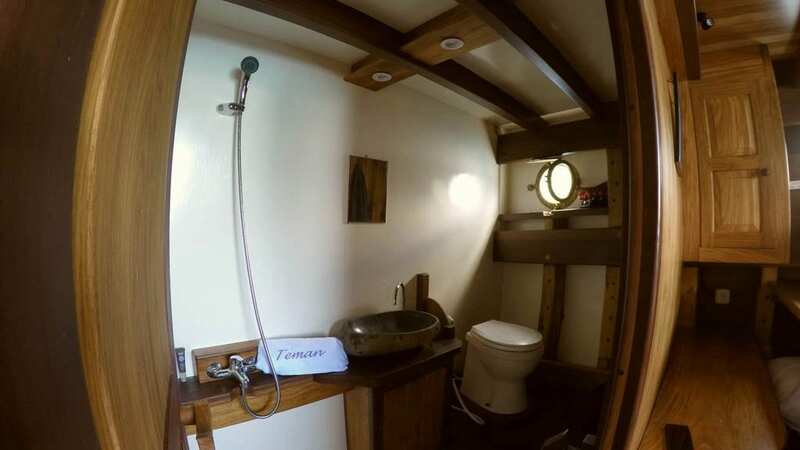 All the cabins have an en-suite bathroom with hot water, remote controlled air conditioning, integrated storage units, charging stations (220v), reading lamps, two portholes and a hatch. 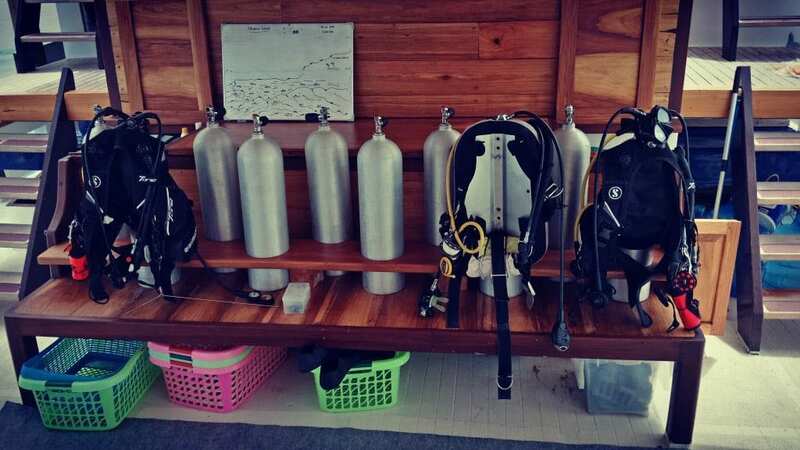 The western Cruise Director, an experienced PADI dive instructor, has been operating on liveaboards in Indonesia for 6 years and is perfectly fluent in English, Bahasa Indonesia, and French. 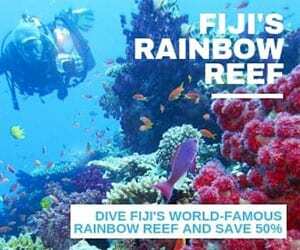 They are supported by two local Divemasters, and two boat masters – one for each of the two tenders. 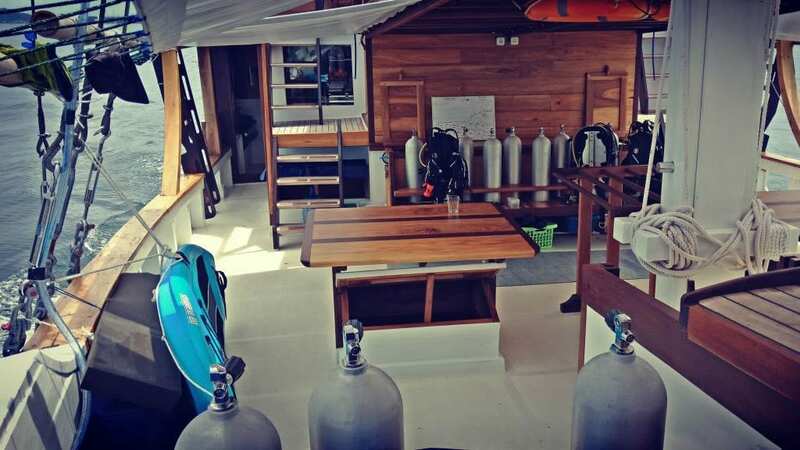 To give guests the best quality of air, the foredeck has been converted to the diving area. It is always protected from the sun, and each guest enjoys their own gear storage unit. 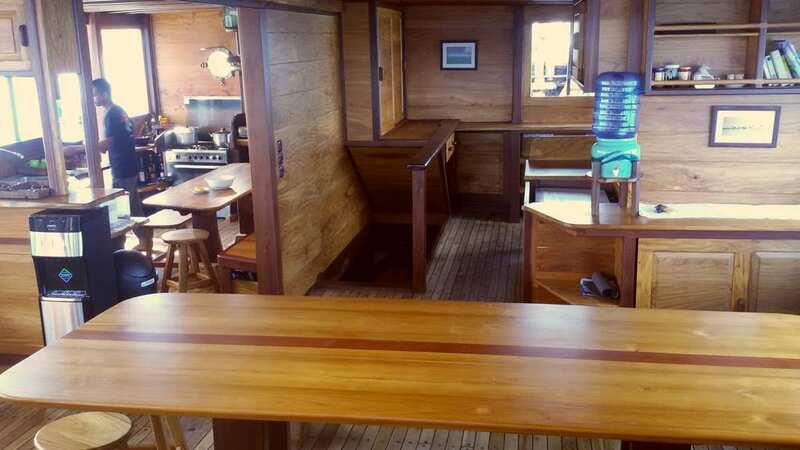 Photographers have two tables at their disposal on the deck and another space inside the boat with numerous sockets (220V). 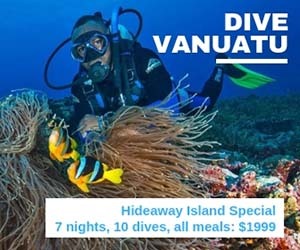 Three dives are planned each day, though additional dives can be done on request (at an additional charge). Some rental gear is also available for an extra charge. 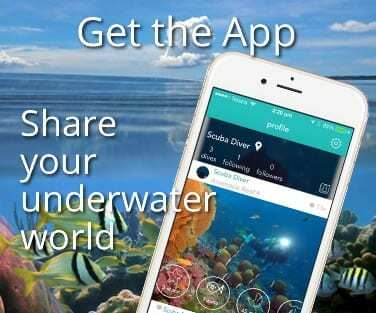 Teman’s schedule follows the seasons, which have a huge influence on the scuba diving and the sailing conditions. From May to October, when the eastern winds are blowing, Teman operates in Nusa Tenggara area, around the Sunda Islands (Lombok, Sumbawa and Komodo). The months of April/May and October/November are the transitions between the Eastern monsoon and the Western monsoon which characterize Indonesia. During these periods, the winds subside before they switch, making the navigation to some of the usually over-exposed areas such as the Banda islands, the Ring of Fire or even Triton Bay, easier. 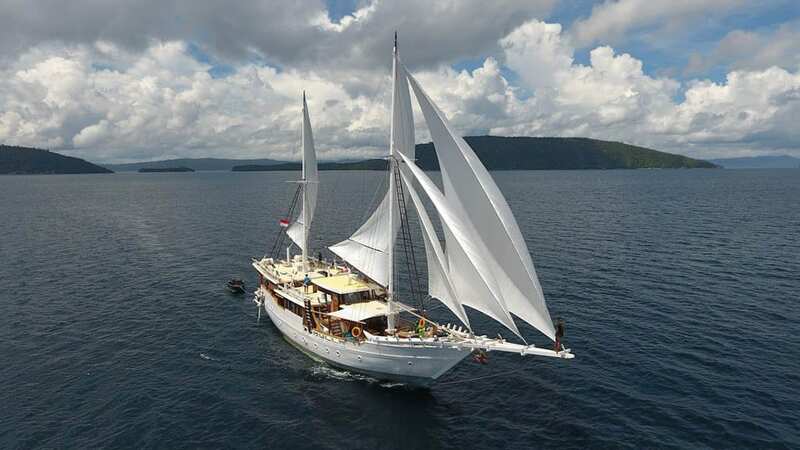 From mid-November until the end of March, when the western winds are blowing, Teman liveaboard cruises the gorgeous National Park of Raja Ampat in West Papua. 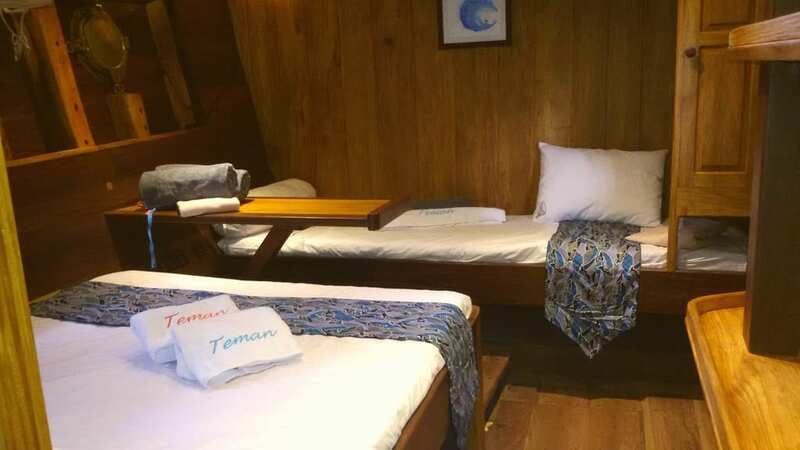 For those traveling in threes and fours who don’t mind sharing a cabin, but want to enjoy longer cruises through all the different regions of Eastern Indonesia, the Teman is an excellent choice.